A designmaker and codemaker, Joe hopes to invent new ways for games to bring people together. The FILTH and the FURY!! Many Happymakers recently defended their graduate theses in the USC Interactive Media Division. I was among them. Click to hear a discussion of the problems of historiography and adaptation I encountered, and the approach I developed to solve them! Today, I changed the project description on Vikingr! . These alterations to the project’s mission occurred in the week before the winter show, and they go deep. Months of local optimization on the problem of making a fun game about Vikings had failed to produce an enjoyable experience, so at my wife’s behest I undertook a challenge: Use this final week to start from scratch and make something enjoyable that addressed the whole scope of Viking life. I’m very glad I did. I threw out the notion of producing a “Dwarf Fortress, but with Vikings and social play” and focused on moment-to-moment pleasures: busy hands in home life (no more setting up situations and waiting for things to happen), sailing with multitouch controls, raiding without complex strategy and micromanagement. I went to a side view with simple sprites (except for the Mode 7-style sailing, inspired by Final Fantasy VI ) rather than the isometric projection. I switched to Unity3D so I could get things going quickly and discourage myself from over-reliance on native user interface elements (or, indeed, from fiddling with them to no end). These changes dramatically improved my project’s forward velocity, people enjoyed playing my game more, and I was in a better position to put more social interactions into gameplay. It seems counter-intuitive that moving towards simple and superficial could make the rich social exchanges I had hoped for more feasible, but it boiled down to the observation my wife had made: If I had spent six months working on home life and farming in such exquisite(-ly boring) detail, there were simply not enough months until May to do the same for sailing, raiding, and social life. I had over-modeled one portion of my game—and not even the important portion, at that! Now that my world signals simplicity, I can employ much simpler types of social exchange without causing inconsistencies in player experience. So, that’s where Vikingr stands right now. I am currently fleshing it out and extending it with additional social exchanges—not trying to cram sociality into an asocial design. tl;dr version: Got an iOS device? Sign up for testing at TestFlight! I vowed recently on the development log to spend two more working days on combat and then share a playtestable prototype. Well, I took a little vacation, I had to wrap up another project, and then there was the holiday, so I finally reached my goal today after an estimated four solid engineering days within that broad time interval. So that’s good news! This is an iOS project that ought to work equally well on iPhones and on iPads. I’ll be distributing this build using the Testflight app, so please visit this link to get registered and send me your device’s unique identifier. This month’s (well, last month’s) prototype covers the core combat of Vikingr . In practice, it would be situated in a larger, more strategic game of viking household management and political simulation, forming an intense, risky, and uncertain means to fame and fortune. Raiding—or being raided against—is one of the emotional high points of Vikingr . Please keep in mind that all art and UI are temporary, and the introductory screen is best thought of as a “debug menu”. One notable difference between this prototype and my future goals is that not all visits to other households should be raids: even in the context of viking raids, a smart raider would prefer to trade with a household that seemed too tough a fight to pick. Vikingr requires the use of Apple’s Game Center service. Before you launch this game, please log out of Game Center using Apple’s Game Center app. Vikingr will ask you to log in to a special “Sandbox” version of Game Center, and you should create a new user account for this “Sandbox”. You’ll need someone else to be playing on their device at the same time; alternately, you can choose “Fake Attack” or “Fake Defense” to play both sides locally. If you do play on the network, I highly recommend WiFi over 3G connections—I haven’t put much effort into resolving bugs with 3G multiplayer yet. For now, everyone is in Iceland and the only valid attack location is Iceland. If the UI tells you that there’s no one to raid in Iceland, go ahead and “Fake” it. Once your raid begins (or once someone raids you! ), tap one of your four vikings (with the green circle at their feet and green names) to activate him. Once active, you can change the direction he’s facing with the arrow buttons or change his combat stance to “Reckless (Attack)”, “Prudent (Attack)”, or “Cautious (Defense)”. There are also two buttons behind the character; the grey one surrenders and the red one flees. In either case you lose control of your viking, but they might escape the fight with their hide intact. Viking culture looks down on retreat—even though your viking’s surrender may be rejected by your opponent (with deadly consequence), at least he won’t live with a reputation as a craven coward. To move one of your vikings, drag him with your finger. Valid movement destinations will light up blue. Move your finger to another hex and release it to start him moving. After this movement, you may notice that a number on top of the viking is slowly decreasing; this viking cannot move again until this “fatigue” counter returns to zero. A viking in an attacking stance will strike at anyone in front of him and will turn to face any attacker. As he deals wounds to others (or as he is wounded! ), combat messages will appear. Don’t get too distracted by individual encounters—you can use the many vikings at your disposal to gang up on an individual enemy or to split up brawls into less dangerous skirmishes. If a viking receives too much damage to one of his six body parts (head, torso, left arm, right arm, left leg, or right leg) it will become crippled and then ruined. A ruined left arm prevents a viking from blocking with his shield, and a ruined right arm keeps him from attacking. A viking with no arms will surrender automatically. Damage to the legs will reduce the viking’s movement radius, and ruination of the torso or head will result in death. The raid is over when all vikings on a side are fled, surrendered, or killed. Afterwards you may read a textual summary of the battle’s outcomes sorted by each viking’s perspective. A future prototype will target these combat results. It will recognize patterns in the combat and movement record and grant vikings titles, epithets, stats, personality traits, and other narrative outcomes based on their relationships to each other and to their enemies, and present them in a more exciting format. Why Combat? Why Now? What Now? Recently, I shared this design log with my industry advisor. His response suggested that I focus less on the intricacies of a detailed combat system and more on the important narrative goals of the project, abstracting combat as necessary. As I understand it, the concern is that if there are too many choices in and too much design emphasis on combat, it will overshadow the rest of the game in the players’ (and possibly the designer’s) minds. That said, I want to take this opportunity to justify my design-time expenditure on combat. The importance of feeling like a Viking and the need for compelling low-level gameplay are clear, but perhaps an examination of the perceived need for a robust simulation of raiding is in order. My goal for Vikingr’s combat mechanics is to drive home the sense that fighting is both glamorous and dangerous, drawing a contrast between the slow, steady, safe progression of farming, trading, and political games with the meteoric rise and precarious position of the raider. To that aesthetic end, maybe there is a more abstract interpretation for conflicts between two groups. My plan at the moment is to spend two more engineering days on the system I’ve already paper-prototyped (and spent some time programming), taking the shortest route from what I’ve got (matchmaking, movement, networking) to a start-to-finish combat scenario with some narrative outputs. Specifically, I’m thinking of some acknowledgements of recognizable patterns: combat style preferences, turnabouts, cowardly or brave acts, and so on–or at least the seeds of these kinds of reports. If, after two days of design and engineering effort, combat looks like it will continue to be a timesink, I’ll put in some hack and get on with things. That, too, is something I need to learn. The latest incarnation of Vikingr is on the iPad. I’m now designing from the bottom up rather than the top down, thinking about the nuts and bolts of a satisfying core combat loop rather than the abstract motivations of narrative. Combat in Vikingr is risky and in no way a default decision, just as in the historical record (trade was a wiser move when the opponent was formidable, though less glamorous). To provide a less micro-managey outer loop, players will control a whole household rather than an individual, and this change should also help mitigate the displeasure that comes from loss of life. Once the decision to raid is made, the player selects a target (one of the Viking lands: Denmark, Iceland, Norway, or Sweden) and a match is made with another active player through Apple’s Game Center service. 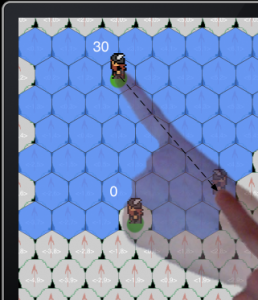 During a raid, each player directs a group of Vikings in battle by adjusting their stance (reckless, prudent, cautious, or cowardly) and moving them around a hex grid in soft real-time. Characters may act whenever their fatigue counter reaches 0. Any action increases fatigue, and fatigue decreases on its own over time. When a character in an attacking stance comes near an enemy, they fight until one of them dies or moves out of the way. On average, reckless attacks beat a conservative, prudent attack; prudent strikes best a cautious defense; and a cautious defense finds opportunity in a reckless offensive. Battle is not about probable outcomes, however: an attacker who strikes from behind or merely gets a lucky hit can pull out a victory despite a poor choice of stance. The Valkyries don’t always choose the best man to win the fight; sometimes they want him in Valhalla. Cowardly flight will lose to any attack, and it provides a much greater mobility along with its social stigma. At this point, my inner engineer speaks up and says that if network latency becomes a concern, this may be revisited as a pure turn-based system or a turn-based system with per-turn time limits. On the life simulation side, the fine-grained week structure may be replaced with twelve months or four seasons per real-world day or, possibly, a system where characters become occupied and undirectable for a certain number of real-world hours while undertaking tasks such as farming, crafting, or travel. I hope to implement the core risk/reward activity of combat and the basics of the other elements needed to support it (deciding when and where to raid and the basics of the life simulation interface) by the end of the month.